Since 1997, ServiceMaster Restoration of Tri-Cities has provided professional restoration and cleaning services in the Grand Island, NE Tri-Cities area including Grand Island, Hastings, and Kearney. Our owner, Jeff Kuntz, originally acquired our Lincoln, NE location in 2009 after spending four years as a team member, and he purchased our Grand Island, NE location in 2013. ServiceMaster Restoration of Tri-Cities is an IICRC-certified firm and we make sure each of our technicians is highly trained to provide quality disaster restoration and cleaning services for homes and businesses. As a ServiceMaster Quality Restoration Vendor (QRV), we pay attention to detail and use the best products and equipment of the industry to help you fully recover after a disaster. If your home or building has experienced severe structural damage from any of these disasters, we can repair the damage with complete construction services. Our technicians are always prepared to help our local community as we have done many water damage and mold remediation jobs for local institutions such as schools and hospitals. ServiceMaster Restoration of Tri-Cities was even nominated for the Marion E. Wade Award in 2014 due to our outstanding customer service. We are standing by 24 hours a day, 7 days a week at (308) 210-2595 to provide emergency restoration services in Grand Island, NE and the surrounding areas. Water damage is an issue that is inevitable in homes and buildings. 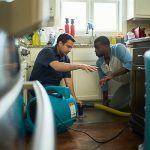 Rain and flooding cause excess water to get indoors and there are several internal issues including plumbing leaks, burst pipes, and overflows that can also result in water damage. Excess water in a home or building should be treated as a serious issue because it will spread deeper until it is removed, increasing the risk of mold growth and extensive structural damage. ServiceMaster Restoration of Tri-Cities provides water damage restoration in Grand Island, NE to extract water and dry the affected areas. Our water extraction equipment can remove standing water as well as excess moisture, and we will thoroughly clean up the affected area to prevent mold growth. When it comes to sewage backups, nobody wants to deal with them. But they must be treated as emergency situations due to the amount of bacteria and pathogens spreading throughout the property. Immediate treatment should occur to prevent the contaminated water from spreading as well as to restore the affected surfaces. ServiceMater Restoration of Tri-Cities is available 24/7 in the Grand Island, NE area to provide emergency sewage cleanup services. Our technicians are licensed and trained to handle all aspects of the cleanup process, providing you with the peace of mind that the affected area will be restored to a safe and clean environment again. Losing your home or belongings to a fire is a very difficult experience. There is often no warning for a fire and it can quickly engulf your home or building and cause extensive damage. The fire itself can severely damage any objects or structural elements in its path and the corrosive byproducts such as soot and smoke residue will continue to damage surfaces and furnishings after the fire is out. As soon as the fire department extinguishes the fire, you must call our professionals at ServiceMaster Restoration of Tri-Cities to stop the spread of the damage and begin the recovery process. We provide complete fire and smoke damage restoration services in Grand Island, NE to reverse the effects of corrosive byproducts and completely rebuild fire damaged homes and buildings. Mold is one of the most despised home invaders because it can threaten your health as well as your property. Mold spores are a natural presence in the air and when the spores find an environment that provide a moisture and food source, they form into mold colonies. The longer you wait to remove mold growth, the more likely you are to experience severe structural damage and related health issues. 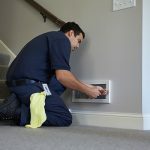 ServiceMaster Restoration of Tri-Cities provides professional mold removal services for homes and businesses in Grand Island, NE. We provide accurate testing with our infrared technology and use powerful chemical cleaners to remove the mold growth. When discovering a violent crime or serious accident on your property, it can be an emotional shock. However, it is very important to stay composed and take the right actions because these scenes are often very dangerous. Biohazard materials like blood and bodily fluids are a common presence at these scenes and they consist of dangerous toxins that can have serious health effects. It is best to have a licensed professional restore the scene after calling law enforcement and EMTs for emergency response. ServiceMaster Restoration of Tri-Cities provides trauma and crime scene cleaning services in Grand Island, NE and the surrounding Tri-City area. 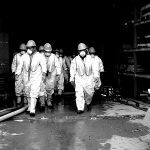 Our technicians will safely remove biohazard materials to restore the scene and we also understand the emotional stress of the situation, taking a compassionate approach. The look of a room or office is heavily affected by the style, color, and condition of the carpet and furniture. The carpeting and furniture are also subject to daily use which causes a slow buildup of dirt and debris that can cause color fading, staining, and even deterioration. If the carpeting and upholstery is not regularly cleaned to remove the buildup, it can affect the look of the space and force you to replace the carpeting and furniture. 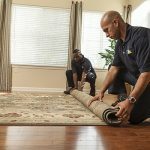 ServiceMaster Restoration of Tri-Cities provides carpet and upholstery cleaning services in Grand Island, NE to thoroughly clean carpeting and furniture upholstery in homes and commercial buildings. Our technicians will remove dirt and stains to restore the color and texture of the carpeting and upholstery fabric with our hot water extraction method. While everyone in the home is affected, hoarding is classified as a mental disorder in which an affected individual is battling an anxiety to part with their personal belongings. While these items can vary, they will accumulate within the home over time and create dangerous conditions for everyone. But they are often immune or even embarrassed by their situation to reach out for help. So they will need the help of a loved one to talk to them and discuss the idea of a cleanup service. Afterwards, you can contact ServiceMaster Restoration of Tri-Cities in the Grand Island, NE area and we will work with both compassion and respect when conducting the hoarding cleanup process, putting them in charge without disposing of anything without their approval. We will then disinfect the property and remove all dangerous threats to restore safe and healthy living conditions. Don’t hesitate to give us a call as soon as they are comfortable with hiring a cleanup service. Most of the time, a disaster such as a flood or storm will cause damage within a home or building without affecting its structural integrity. 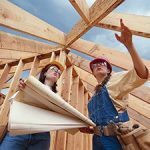 However, there are times when disasters are powerful enough to cause deep, widespread damage that requires full construction services to repair. ServiceMaster Restoration of Tri-Cities provides reconstruction services in Grand Island, NE to help stabilize and rebuild homes and commercial buildings that have sustained severe damage. 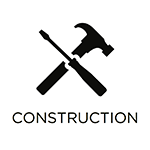 Our construction crew will examine the damage, form a step-by-step restoration plan, and ensure that each step is executed to return your home or building to its normal state. When a disaster such as a flood, fire, storm, or mold growth occurs, it is common for the damage to spread and affect your personal belongings. Anything within the home or building can be affected and certain items like clothing, jewelry, electronics, and others can sustain permanent damage if they are not properly cleaned and restored. 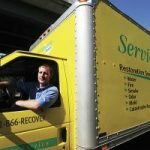 ServiceMaster Restoration of Tri-Cities provides content cleaning and pack-out services to effectively clean and restore a range of damaged personal items in Grand Island, NE. We will quickly identify your damaged items and start the restoration process to prevent permanent damage. If the restoration can’t take place on-site because the home or building is unsafe, we can take your content to our facility with our pack-out services for restoration. Certain disasters, such as fires and storms, have the ability to damage the exterior and structural core of a building which can leave it vulnerable and unstable. Holes in the siding or roofing of a home can lead to further damage as wind, rain, animals, and vandals can enter very easily. If the structural core of the building has been compromised, then there is a risk for collapse. ServiceMaster Restoration of Tri-Cities provides emergency board-up services to protect and stabilize heavily damaged homes and commercial buildings in Grand Island, NE. Our technicians use high quality materials to cover holes in the siding and roof and ensure that the structural core is stabilized to prevent further issues. The employee was quick in returning and starting the job but the project has yet to be completed. Service was quick and efficient. Employees we respectful .